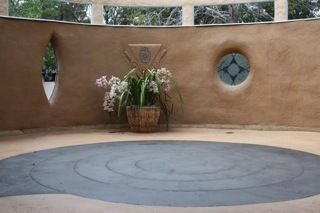 Ceremonial space which was built for Goddess and Her seasonal creativity, as expressed in PaGaian Cosmology – Blue Mountains, Australia. PaGaian Cosmology is the ongoing practice and the co-creation of Glenys Livingstone Ph.D. and Taffy (Robert) Seaborne M.A. (Social Ecology). As of December 10th 2018, MoonCourt and residence was sold to others who love the space and will do much creative great work there; Glenys wanted to go live closer to her mother in her homelands of origin, where she continues her practice and teaching of PaGaian Cosmology, together with Taffy Seaborne. 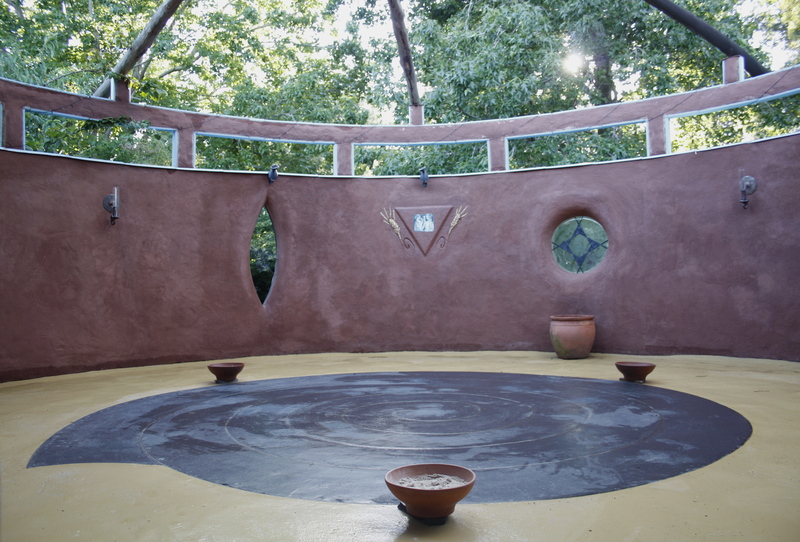 If you are inspired to build such a ceremonial space, I offer you some cosmology and ceremonial practice to go with it, in an on-line course over the period of a year: PaGaian Cosmology: a Celebration of Goddess and Cosmogenesis in the Wheel of the Year, facilitated by Glenys Livingstone Ph.D.
Below is a photo of MoonCourt at our Place “Bru-na-BigTree” as it had emerged by September 2009, taken as we prepared for Eostar ceremony. 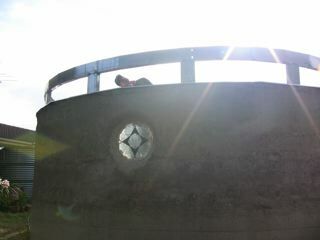 The Seasonal markers are on the wall: Winter Solstice window with Triple Spiral on the left, the Equinox triangle (with Loughcrew symbol in the centre, which was later changed to an image of Demeter and Persephone), and the round Summer Solstice window on the right. 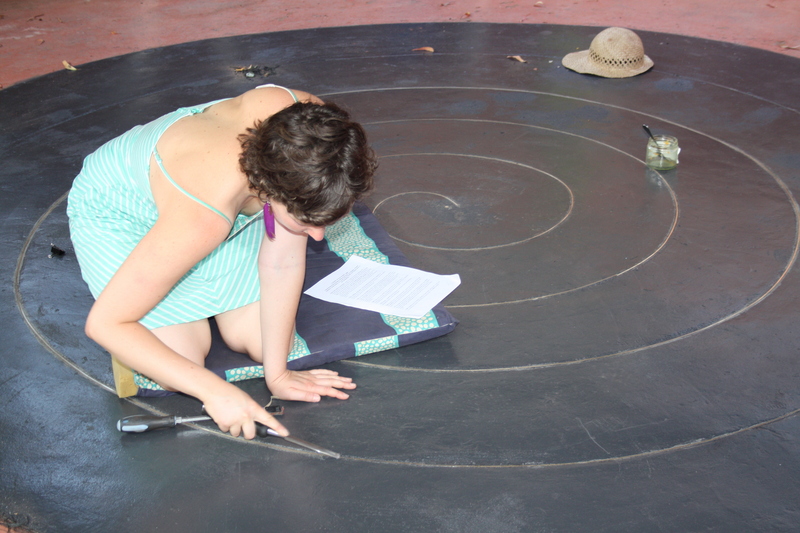 The floor has a brass spiral representing the Universe Story – ready for Cosmic Walk rituals. 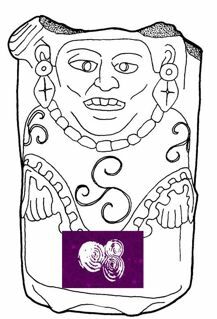 The artwork on the Equinox marker is now an icon of Demeter and Persephone, whose Mysteries we celebrate at both Equinoxes. This a change from it’s original artwork, you may notice in some photos. 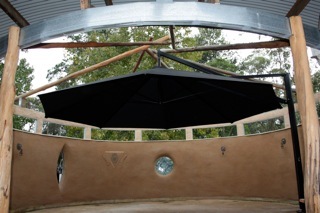 and PaGaian MoonCourt – the roof and shelter. 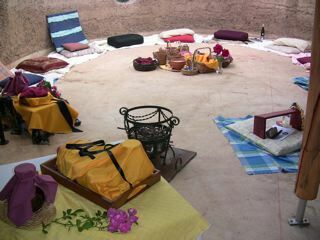 BigTree is the affectionate name for our Place … where the Akkademie PaGaian Cosmology happens – the rituals, the courses, the writing and all matters domestic, which are the basis of the religious (connecting) practice engaged in here. Taffy and I have commenced the building of new space for the rituals. 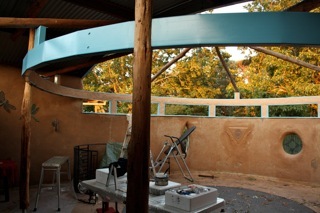 It will have cobwalls and rammed-earth floor, an open roof (shade sail of some kind) and much more … to be unfolded as we go. 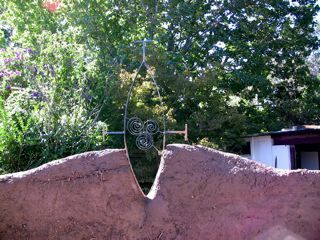 Just yesterday we ordered wrought iron artwork of the Triple Spiral within a Winter Solstice window which will be in the Vesica Piscis shape – the yonic sign of Goddess. 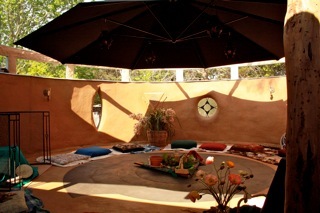 We might call it the PaGaian Ritual Courtyard … a Place for courting the Mother. The pole in the middle of the foundations, marking the centre, is a garden torch that will be used to light the Autumn Equinox Underworld in the ritual this weekend. 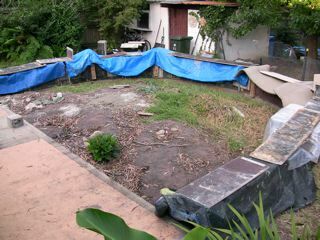 I’m not sure whether the Underworld might be able to be situated on the Courtyard surface … we’ll see what the state of it is by Saturday 22nd. the Moment of Equinox – Autumn Equinox at our Place on EarthGaia. 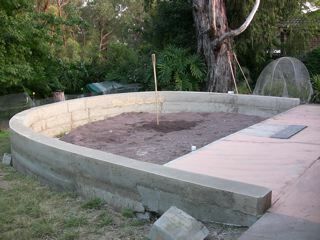 Taffy marked out the place of sunrise this morning, as seen from the centre of the Courtyard, on the foundation wall. 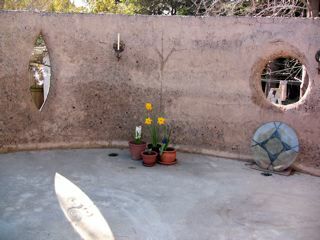 He also marked the place of sunrise for Summer Solstice as we know it to be, but this time as seen from the centre of the Courtyard: so we can put the Summer Solstice window there in the wall. He did the same for the Winter Solstice place, and had me hammer in the marker. Taffy is making a video of it all, which will probably go up on YouTube. It had rained most of the day, but cleared enough for us to “go out into the Night with Persephone and plant our seeds.” The full Moon came out and took a look at us too! 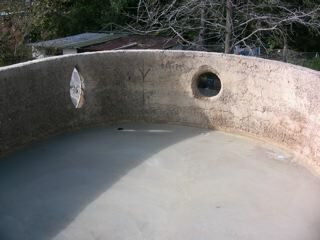 Taffy buried a special heart shaped stone in the centre in the foundations. As he was feeling the loss of this stone, he was visited next day by an ibis (on the neighbour’s roof) – associated with the heart shape and temple building. We have never seen one of these birds here before. Taffy took video footage which will eventually go into documentation of the building of this sacred place. of an artifact and saved the image in my picture file. 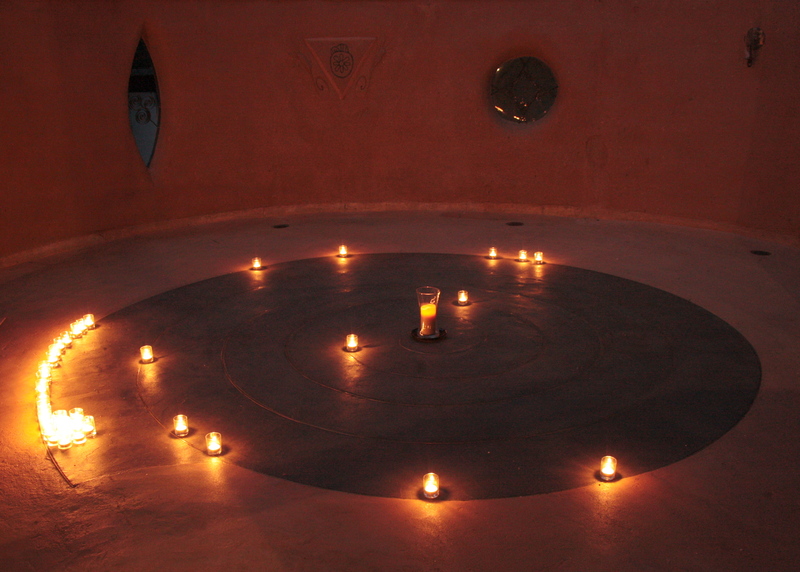 After much playing around with words, Taffy and I have decided to call the ritual courtyard a PaGaian MoonCourt … this being a new word for Sacred Space, instead of “church”, “temple” or equivalent. A PaGaian MoonCourt is for celebrating Cosmogenesis – the Triple Spiral. It is a place for getting caught by the Moon, where Her law/lore is laid out. The seasonal rituals as we do them are a celebration of the dance of Light and Dark – the rhythm of waxing peaking and waning, as Moon holds them within Her round face. 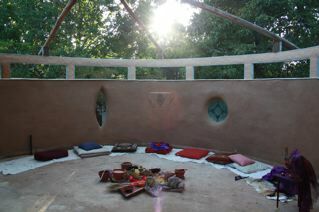 We did also think about naming it a MoonAsylum … for it is a “refuge” for learning and celebrating Her Wisdom. 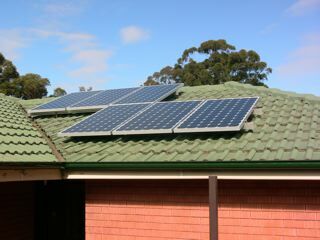 and solar panels go in the same day … 12 on the roof altogether. Our electricity meter now goes in reverse! 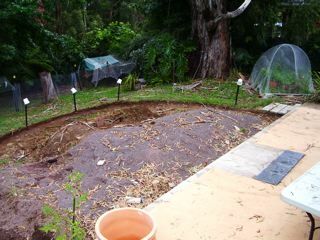 June 18th 2008, the floor has been laid – not quite finished but functional for Winter Solstice ritual on the 20th … phew! The MoonCourt with its seasonal markers of Sun at Winter and Summer Solstice and the Equinoxes is mind-altering I am finding. It is placing me in a new way. 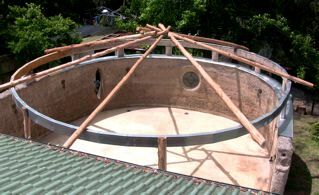 Building your own MoonCourt is an ecological way of shifting one’s mind .. build your own “Newgrange” – Bru na “wherever” – instead of flying to the original … though it is nice to know it is still there and its energy is creating this one. 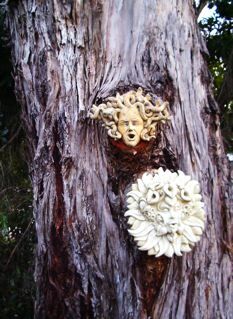 PaGaian Cosmology celebrates the Virgin/Young One aspect of Goddess throughout the light part of the cycle … and Green Man is included as a face of the Virgin dynamic of the Triple Spiral, the Urge-to-Be who expresses Herself in all beings and genders. 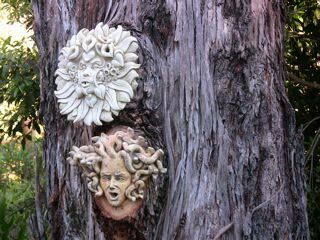 The Crone/Old One aspect of Goddess is celebrated throughout the dark part of the cycle … and Medusa is one of Her faces – not “Old” but definitely One who Creates-Space-to-Be, which how I understand the Crone dynamic of the Triple Spiral: She is essentially Creative. For more: see Chapter 3 or “Search this Site”. MoonCourt as we approach Spring Equinox – early September 2008 … but still more to done yet: have to get that Summer Solstice window in, artwork at the Equinox marker (where the flowers are), rendering, a reciprocal roof and finishing the floor. Oh my Goddess … what is happening now! 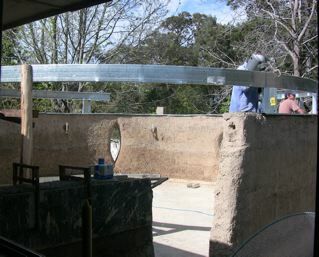 Taffy says our MoonCourt is temporarily a steel henge. As I looked at the three markers for the four solar points of Equinoxes and Solstices on the MoonCourt wall, I realized another valency of the significance of the Triple Spiral. I hadn’t seen that before … how Sun moves back and forth over the period of the year, through three points on the horizon: the Equinoxes are the same midpoint. Having this construction is mind-altering. 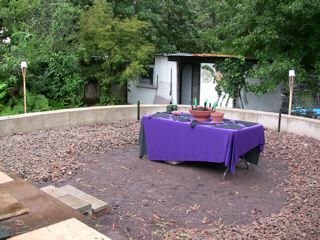 And here is a photo of Spring Equinox morning 2008 @ MoonCourt – after the ritual the evening before, and after the wind had blown quite a bit of the decorations away. 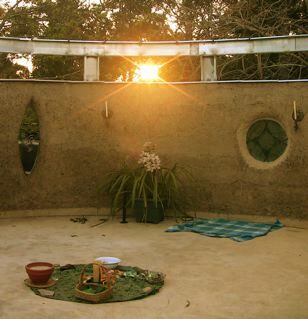 Sun is rising directly above the Equinox marker – midpoint between the Winter Solstice window and the Summer Solstice window. 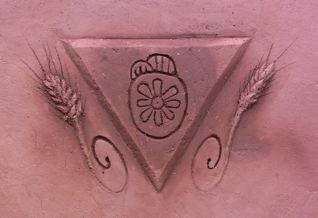 The Equinox marker will have some artwork there by Autumn Equinox 2009. … and very pleased for MoonCourt to be linked here: Glastonbury Goddess Temples Elsewhere. I feel Glastonbury as a Home of my lineage, and of the tradition celebrated in the MoonCourt. And Celebrating Mabon 09 – the video for YouTube that Taffy and I made from footage and photos taken over a 48 hour period in the creation of the ritual and the “leftovers”. There is also this one about the initial lighting of the Triple Spiral in the Southern Hemisphere: Triple Spiral @ Bru-na-BigTree.